Freshly chopped summer produce and preserved vegetables layered over a bed of kale hummus and topped with pita chip croutons. 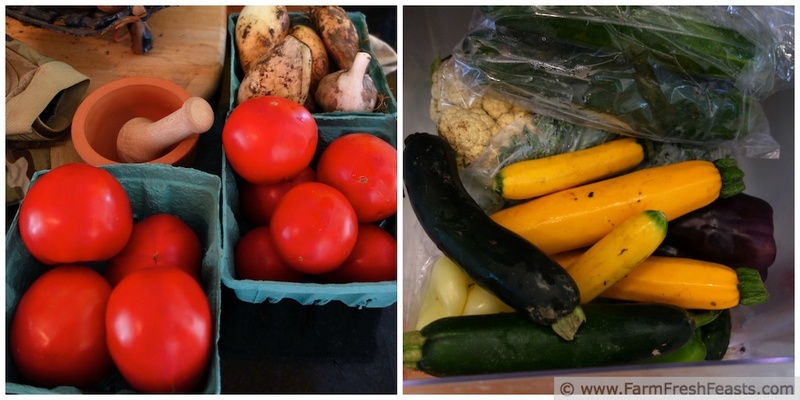 The other day I shared how I can or freeze summer produce to enjoy during the winter. Today I'm sharing how I can take the fresh farm share bounty and make a fast supper (for one) or appetizer (for two) in minutes. I've travelled across the middle of the US recently, and many non-highway roads I've been on have had farm stands. These stands are selling tomatoes, melons, corn, peaches, cucumbers, squash--the bulk of the summer produce is ripe and ready from Michigan to Delaware (and probably other places, but I haven't been to them this week). A CSA farm share haul from a few weeks back. With all this ripe fresh goodness at your fingertips, making a quick and delicious dinner is easy. I brought home the farm share box, realized we had plenty of leftovers for the kids to scrounge dinner, and decided to treat myself to a riff on my Five Layer Mediterranean Chicken Dip. I'd first made that dip before cucumbers and tomatoes were in season, and I'd thought the concept (base of dip topped with goodies and eaten with pita chips) was a good one. Mine started with a base of Kale and Sumac Hummus (recipe below) but any hummus will do. I also keep a few jarred vegetables on hand (olives and artichoke hearts) to add some layers of flavor to the fresh produce. As an aside, in my Visual Recipe Index by Ingredient (a page on the bar above) I have a category for Veggies in Jars where I index my recipes that use artichokes and olives, as well as capers and sun dried tomatoes and probably something else. All I needed to do was grab a cucumber, a banana pepper, a couple of tomatoes, and after a few minutes of chopping I had a fresh crunchy cool zingy dinner ready to go. When I realized that I'd unwittingly combined many elements of Fattoush into an appetizer, I decided to call this Fattoush Dip with Kale Hummus. Only one problem--I was at the end of the bag of pita chips. So I quickly regrouped (I am a military spouse, after all, and plan F or U or B or R is my specialty), used the pita chip crumbs as croutons, and turned this into an appetizer eaten with a spoon. Combine all of the above ingredients in a food processor. Pulse several times, then scrape down the sides and process until finely blended. Allow the hummus to hang in the refrigerator for a few hours to blend the flavors, but it's best served at room temp with a dribble of olive oil over top as shown below. Yes, I am a liberal dribbler. Spread hummus on a dinner plate (mine are about 8 inches across, so maybe salad or lunch plates but smaller plates help with portion size). Top with cucumber, tomato, cheese, and the rest of the veggies. Scatter pita chip "croutons" over top, and sprinkle a pinch of salt and a few grinds of pepper on top. Dig in with a spoon. NOTE: If you have whole pita chips, don't break them up--just make sure you've chopped all the veggies pretty small and scoop up the layered dip with the pita chips. But if there's some crumbs at the end of the bag . . . you know what to do (and now I'm singing Hey Ya). 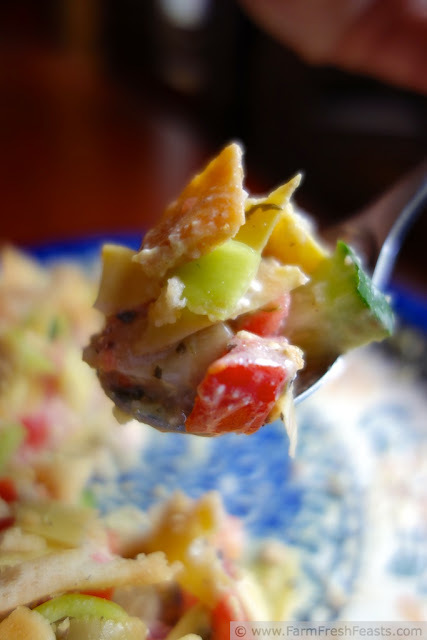 Have you ever said "fattoush-y" before? I'm growing banana peppers for the first time, because I really like them pickled on sandwiches so I figured I'd make my own, but my plants so far are giving me single banana peppers, not a pickling amount. So I've put some on pizza, and in a salad, and now this--they're good. But I'd rather put up a jar full! That's one song I would definitely sing with you. I literally have every ingredient for this in my kitchen right now (farm shares for the win), although my hummus is just the regular store bought stuff, and I've no pita chips. I do have bread though and the skills to make croutons. I'm also dining solo tomorrow night and since my Hubby isn't a huge fan of olives or artichokes, but I certainly am, your timing is impeccable. Thanks. See, this is one of the ways you treat yourself--eat all the artichokes and olives your lil heart desires. I'm glad I put this up today. You've no idea how gratifying it is to run around seeking wifi (I was on vacation last week) and emailing photos back and forth with the spouse for processing ideas in order to get the post up, and receive "I've got all these ingredients now" comments. Does my heart good to read them, thank you very much. When I say fattoush-y I sound like Ellen Degeneres in my head. Great flavors!!! I really love Sumac and don't use it enough. This hummus was the first time I used mine--I'd had it in the back of my mental 'spices to buy' list for a few years, and I finally bought it this summer during a Penzey's pilgrimage, but then I had to remember what I'd wanted it for. Alanna's A Veggie Venture and Liz's Lemon Bowl to the rescue, I remembered the flavor idea I'd had. Am I the only one with a mental 'spices to buy' list? This looks great! 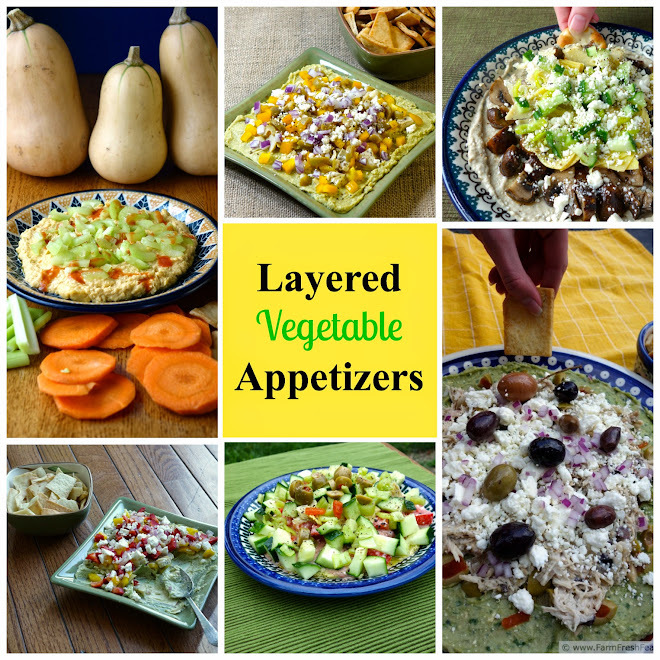 I am a fiend for almost any kind of layered dip. I really like your hummus recipe - I may have to try that subbing in spinach for kale (hubby doesn't do kale at all). Thanks! I am sure spinach would be delicious in hummus--if I ever get any I'll have to try. May have to start growing my own this fall. I'm becoming a fiend for dips for dinner, there's something very relaxing about it. I'm not sure which part of this I like best...the kale hummus, the fresh vegetables or the marinated artichokes. What a fantastic dip! I buy my artichokes by the vat from Costco, especially during hockey season, so I'm really happy to throw them everywhere they will play nicely with the rest of the kids on the plate. They got along just fine in this dip. Thanks! On my FB page I posted the photo showing how my dog Simon thought it looked delicious, too. His nose was a few inches away from the plate in the top photo when I was taking the picture! YUM! I love the fattoush, and since we're getting new cucumbers every day from our garden right now, I know what I'm making this weekend! Lucky you to get cukes from the garden! I was gone for a week, and haven't yet checked my garden to see what happened while we were away. I'm hoping that an unwatched tomato finally ripens, but we'll see after dawn. 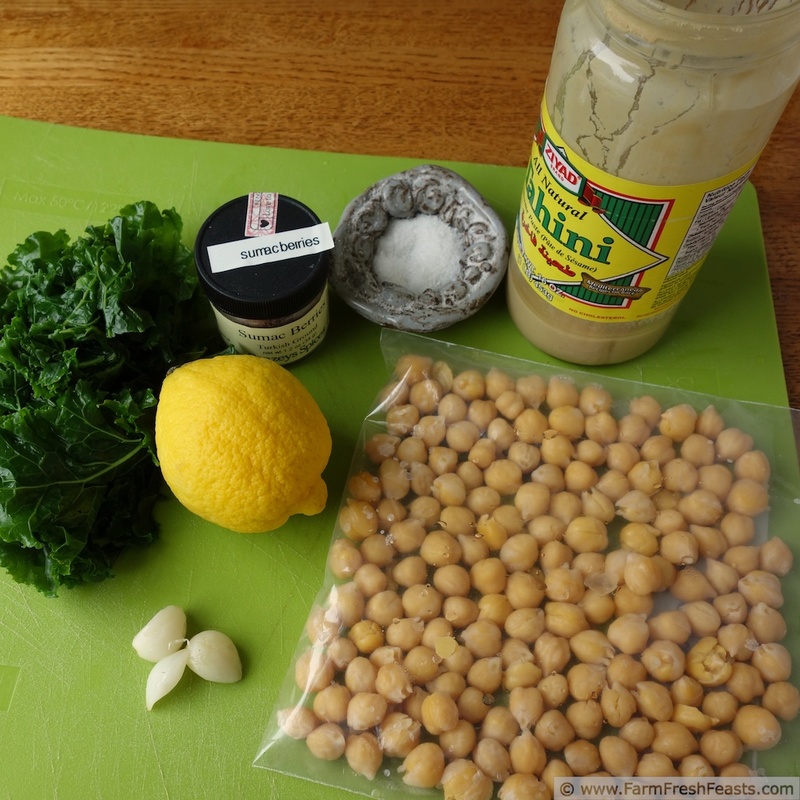 kale hummus? my girlfriend is going to flip over this! 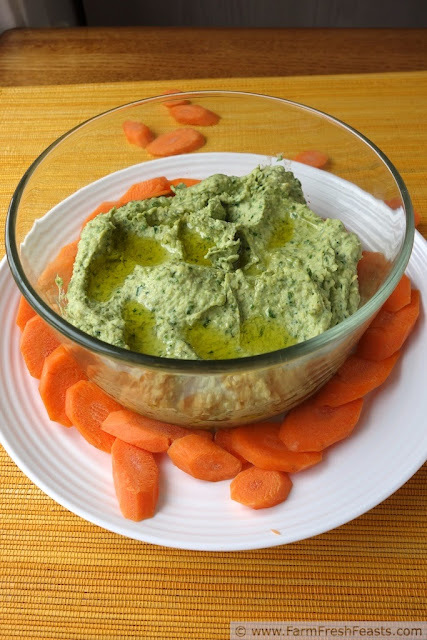 we make kale pesto all the time but kale hummus is sure to be our new favorite thing! Heather, and here, I need to make kale pesto! I figured I'd try when it was more fall kale season. Kirsten, this looks SO refreshing--perfect for a muggy summer day. We have some mega good Middle Eastern food here in SE Michigan but I have yet to try making it at home. I might have to start with your fattoush since it doesn't look too complicated. Plus, it's such a great way to use all this fresh summer produce! It's so fast to throw together, too. Thanks again! Hmm, never tried putting kale in hummus before but I see how it could work, and I do have sumac on hand. 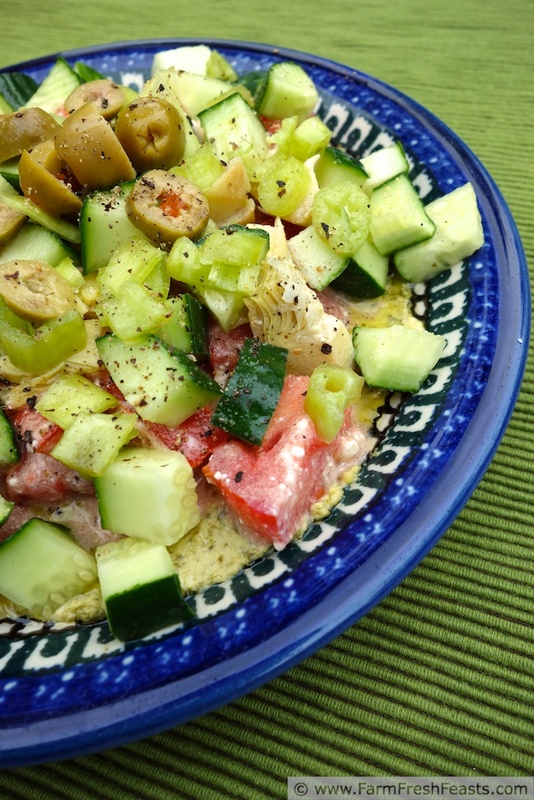 I love embellished hummus like this with fresh veggies on top-- thanks! I think a plate of embellished hummus (love that term) is a wonderful dinner on a hot summer day.